Gloria Bell is a free-spirited divorcee with children who have grown up. She enjoys music and takes to letting loose at various dance clubs in Los Angeles. As if by chance, she meets another, older divorcee named Arnold. His divorce occurred far more recently, and his two adult daughters do not work, completely relying on him to support them. Despite their differing backgrounds, the two of them quickly enter a relationship, though Gloria may soon learn that it’s not to last. The year 2013 marked the premiere of Chilean director Sebastián Lelio’s Gloria. It was released to a nearly universal critical praise, amassing an impressive 99% on the aggregate review site Rotten Tomatoes. Critics especially enjoyed the character of Gloria and how she represented the type of character often neglected in Hollywood productions. It was then highly fitting that, four years later, he would journey to the United States, team up with A24, a company favored by critics for their anti-Hollywood approach to filmmaking, and reimagine his original work in an American setting. Playing the title character is Julianne Moore, who turns in an excellent performance. Gloria Bell is a character who isn’t defined by what she is. You experience all the high and low points she does. She has a lot of fun dancing in the clubs she frequents, and you feel the frustration when she deals with her obnoxious upstairs neighbor. She is also not afraid to speak her mind – particularly when she consoles her friend over losing her retirement benefits or has conversations with Arnold about the end of the world and gun control. Her most memorable moment occurs at the end of the film. When it’s clear the relationship isn’t going to work out, she takes the paintball gun she received from Arnold and vandalizes his house, shooting him when he walks outside. After that point, she encounters a man who seeks to date her, but she refuses to take him up on his offer. For that matter, the other acting performances are solid as well. Throughout the ups and downs of their relationship, it would be easy to dismiss Arnold as a dime-a-dozen bad man whose sole purpose in life is to break Gloria’s heart because it’s there. The reality is a little more complicated. Though not exactly sympathetic, Arnold has a bit of depth to him. You get the sense that he supports his daughters’ unhealthy relationship with him not because he thinks they’re failures, but rather because he is permissive to a fault. As such, his worst actions, most notably abandoning Gloria during a date in Las Vegas, involve him passively shunning her rather than being actively malicious to her. In most Hollywood productions, dysfunctional relationships solely involve a man beating a woman. Mr. Lelio’s work makes the case that a relationship can be toxic even if neither person strikes the other. With all it has going for it, Gloria Bell must logically be an enthralling watch. Unfortunately, I would argue that is not the case. The Achilles’ heel of this film is that for all of its good plot developments and stellar acting performances, there’s barely any cohesion to it. You’ll see interesting subplots pop up, but just when you think the film is about to go in an interesting direction with them, they get dropped immediately. The most obvious example involves Gloria’s rambunctious neighbor. He is often heard yelling at the top of his lungs about whatever is annoying him at the moment – including Gloria when she is telling him off. One night, he slams against Gloria’s door. He eventually leaves when Gloria informs him he is on the wrong floor, but in his haste he leaves a package behind. It’s heavily implied to be drugs, but other than one brief appearance later, he is never mentioned again. Gloria is later seen using these drugs, but this too fails to contribute anything substantial to the story. This isn’t an isolated incident, either. One of the conversations Gloria has with Arnold involves talking about how any day could be their last. While this would be a poor attempt at foreshadowing under ideal circumstances, it’s even more bizarre when it turns out they were just exchanging particularly morbid pleasantries. Her daughter randomly makes the decision to move to Sweden to be with her boyfriend. Her son is left by his wife to live in the desert with their infant child. Gloria is later diagnosed with a condition that requires her to use prescription eye drops for the rest of her life. One coworker’s self-worth is being challenged. All of these story beats would be intriguing if properly implemented, but they invariably lack either a setup, a payoff, or in extreme cases, both. As it stands, it feels as though the director devised a lot of individually good ideas only for him to shoot the respective scenes without implementing any natural transitions or actively developing his characters. The greatest indication of how incoherent this film is concerns a sphinx cat that keeps getting into Gloria’s apartment. This serves as a running gag throughout the film. Though it was only mildly amusing the first time, subsequent times made it feel forced and out of place. This is very much something a typical Hollywood comedy at the time would do, so it is highly jarring seeing it appear in an ostensibly contrarian A24 production non-ironically. By the end, she chooses to adopt the cat. Why, exactly, she does this isn’t clear. In another film, it would have been an excellent way to punctuate the end of development. The problem is that the film’s indecisive nature doesn’t allow her to have a comprehensible character arc. Like every other major decision in the film, she does adopt the cat just because she can. Have you ever watched a film, read a book, or played a video game and expect it to go anywhere and it just doesn’t? If so, that is exactly how I would describe the experience of watching Gloria Bell. Stuff happens and people do things, but there’s no deeper meaning behind them. You’ll think certain developments or conversations are foreshadowing some kind of payoff, yet it never happens. Gloria Bell also suffers from this weird problem plaguing many slice-of-life films in which characters talk about things the writers believe they should rather than what they do in reality. You’ll get scenes in which Gloria’s doctor brings up the mythological interpretation of how cats became domesticated and Arnold talking about every generation believing the world is doomed. In doing so, Gloria Bell is an example of a film that tries to have its cake and eat it. The critics who praised the film love how realistic it was, yet there are many scenes in which characters talk in a highly stylized fashion that honestly wouldn’t be out of place in a Hollywood production. Like much of A24’s output, I feel Gloria Bell to be the kind of subversive work that, rather than proving films don’t need to follow Hollywood’s example to be good, inadvertently justifies their rival’s existence. For that matter, I also think of Gloria Bell as the film equivalent of an environmental narrative game – better known as walking simulators. You get these vague affectations of a good story, but there’s no real challenge driving the characters. 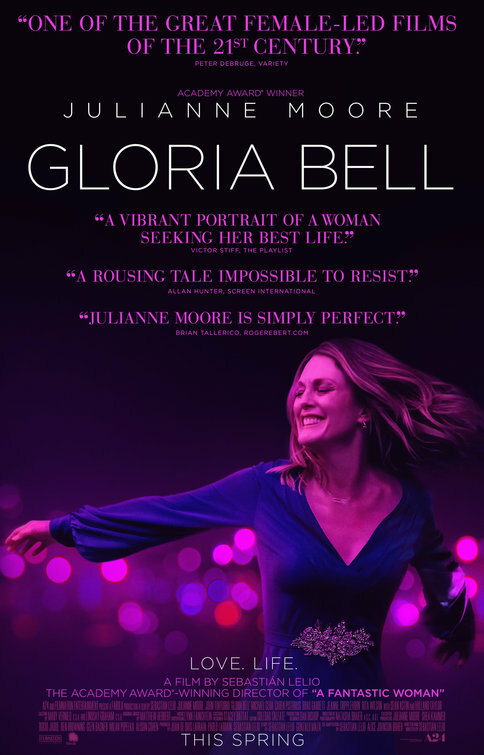 Gloria Bell was a film praised for being presented in a realistic fashion, portraying people you may have met. While I won’t contest that argument, I don’t really see the point in specifically watching a film about a fictional character who is like someone you may know. It would be much more meaningful to actually interact with the person in question instead. ← March 2019 in Summary: Lousy Smarch Weather! But… is it so bad it’s good!? It’s not even really bad, it’s just kind of… there. About the only other thing I can say about it is, “Yup, that was definitely a film I just watched”. Well. I applaud you for finishing a film that didn’t go anywhere. I would have given up along time ago. I am not a fan of books, games, or films that seem to have no direction. It’s like an artist doodling on a paper expecting a masterpiece to come out of it. Well, I was in a theater, so I didn’t really have much of a choice, but thanks! Gloria Bell is a textbook example of a go-nowhere film. Unless you’re Captain Beefheart or Gibby Haynes, you can’t really expect to flail around and expect a masterpiece to result.